Technology has been advancing at a fantastic rate. My dad likes to tell about how he and his brothers were convinced there'd by flying cars by the time they were adults. He jokes that he's been gypped and he wants his flying car! Those little stories our parents and grandparents tell say a lot about them and their lives. They're familiar and fun to hear. I can just picture my dad, a freckled red-headed boy with his nose deep in a Tom Swift novel dreaming of flying cars. There are other stories told in our families too, important stories about how we became who we are. 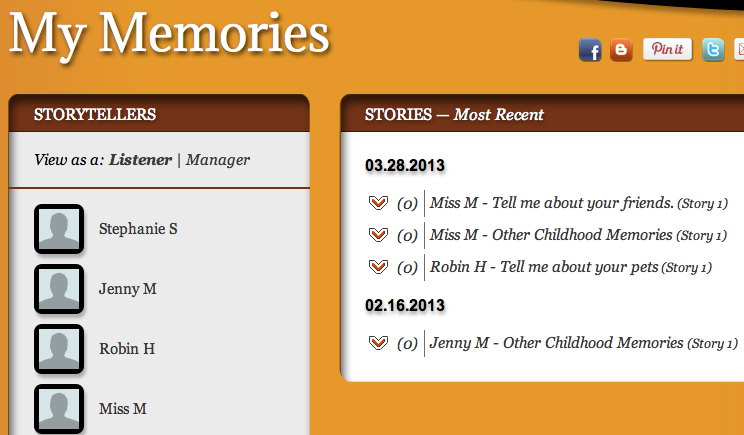 And with the Saving Memories Forever app, these stories can be recorded in the storyteller's own voice. Saving Memories Forever is the brainchild of Jane and Harvey Baker who, after putting together a complete tree of their family, discovered there was a void that could not be filled by a mere knowledge of who married whom and who was the child of whom. They had no sense of who their ancestors really were. What were their favorite childhood memories? What dreams did they have as youths? If they were sitting with us today, what song would they sing? So technophile Harvey developed a way for people to use modern technology to record and share family memories. If you have a smartphone or tablet, you have a recording studio in your hand. Anywhere you are, you can record! In order to use Saving Memories Forever, you must first register as a New User. You can do this by accessing the website at www.SavingMemoriesForever.com (click the Sign Up button in the top-right corner) or via your smartphone by downloading the free Saving Memories Forever app. Once you are registered, there are two ways to record, save, and share family stories. The best method is by allowing your iPhone or Android app to guide you through the recording process. You can set up a Storyteller within moments and be presented with a list of engaging interview questions that can help get the stories flowing. When you've finished recording, tap the Upload button and the story will immediately be uploaded to the Saving Memories Forever server. The website is private and only those you've invited can listen to the stories you record. The second method involves recording mp3 files from your computer and uploading them manually to the website. This method is workable, but a lot more cumbersome. There are several online guides and manuals that will help you if you get stuck. 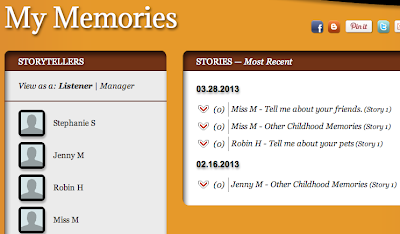 Regardless of which method you use to record and upload stories, you can then log into the Saving Memories Forever website to manage and share your stories. If you wish to use Saving Memories Forever, you can do so for free or you can pay a monthly fee of $3.99 (or $40 a year). The premium subscription gives you access to some fun extras including an unlimited number of story tellers and story listeners, and the ability to attach photos and text documents to the stories. The most exciting difference between the free and paid subscriptions, however, is the ability to use key words to tag and subsequently search for your stories. This would be immensely useful if you were recording and cataloging a large number of stories. Go here to see in more detail the differences between the two types of subscriptions. Now, since I do not have a smartphone or a tablet I was forced to rely on method two to use this program. And frankly, I don't recommend it. Don't get me wrong, it works. But it is not particularly streamlined compared to the app. In fact, I was ready to dismiss the whole thing as too much hassle until one day my mom came for a visit and brought her iPad. With her permission I installed the free app and logged in. Within minutes we were recording the story of her "pet" chicken Chirp-Chirp, who wasn't a pet at all and eventually became the family dinner. When the story was done, all it took was a tap on the screen and the whole thing was uploaded in an instant. Now this was something to get excited about! I could picture a family gathering with everyone sitting around the table gabbing and swapping tales. It'd be a simple thing to set up a smartphone or tablet in a central location and record all the fun narratives. The playback from the iPad at least was crystal clear (I was very impressed)! I'm not sure how some of my older relatives would react to this newfangled business. My grandma has never liked the phone. She's told me before that they went without a phone for years and then when they did get one, the cost of long distance calling was so high that it was only used for emergencies. To this day she associates the ring of the telephone with bad news. I'm quite certain she would not like to be "interviewed" and recorded. She might not mind a less invasive method like the around-the-table scenario I mentioned above. I love stories. I love to hear about people's lives. I believe our stories are important. I also believe people want their stories to be heard. I think that's part of what makes social networks so popular -- it gives people a platform to share their stories with people who care. I could see Saving Memories Forever being used almost like a video log (vlog) to record a person's own thoughts and memories about people and events in the past, or even current events happening now. If you don't have a smartphone or tablet, the usefulness of this program diminishes greatly. If you have a cell phone (that's not a smartphone) that has a recorder that uses mp3 format, it would be much easier to use than my cell phone that records audio files in a much more obscure file format. 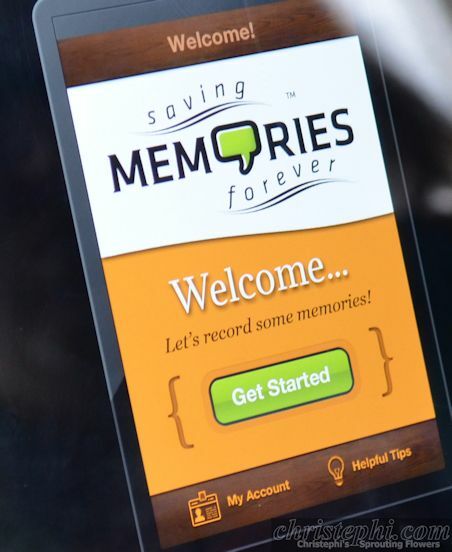 Saving Memories Forever has partnered with The American Widow Project, a non-profit organization that provides military widows with peer-to-peer support, but I could see this app being used by all kinds of families who are separated by great distances whether because of the military or business or any number of reasons. Many people are really into genealogical research, I'm not one of them, but if you are, I highly recommend Saving Memories Forever! Now that I am older, on the ground is good for me! Counting down to another Kids Clothes Week!